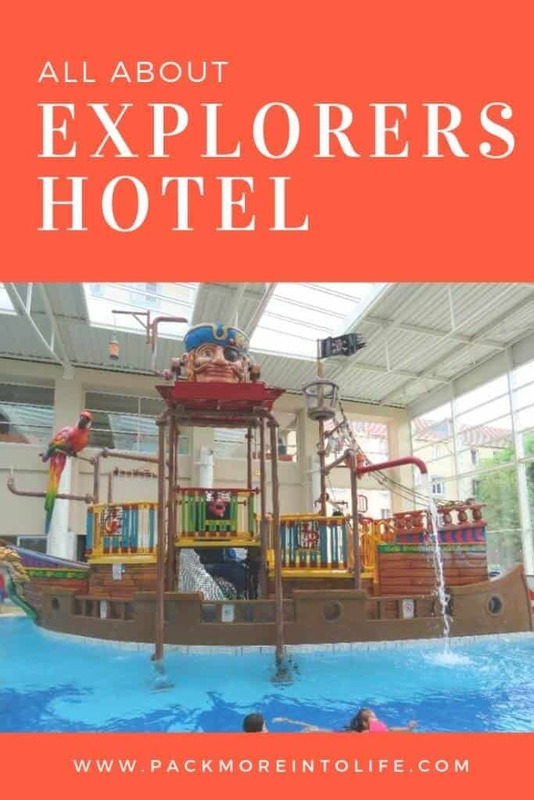 Want to stay near Disneyland Paris, but not pay the high price at a Disneyland Resort/Hotel, then Explorers Hotel is a perfect choice. 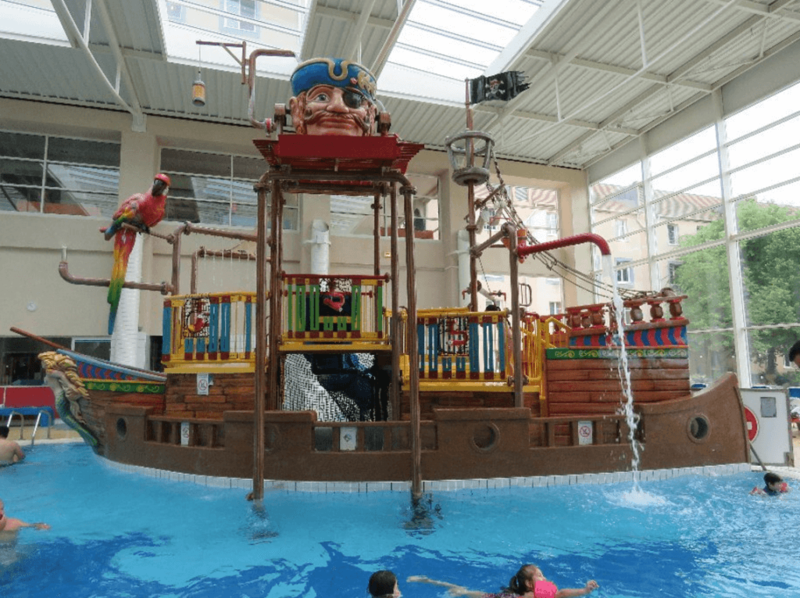 We picked this hotel for its family-friendly atmosphere including a huge pirate-themed indoor water park, outdoor playground with pirate ship, indoor net climbing zone, buffet meals, indoor cinema and more! I’ll let you in on all amenities and important things to note. We typically book via booking.com since we can earn rewards for discounts on future bookings. I’ll also check the hotel page to see if there is a better deal. If you’d like to book via booking, here is a link directly to the hotel page. We booked a Superior Family Room for 4 with access to aquapark. It featured a double bed and a bunk bed for our son. It averaged around 150 euros per night before tax, but that included a free breakfast, free parking and free 10-minute shuttle to Disney. Prices depend on a weekend versus weekday and the time of the year. Indoor Water Playground– This is the main reason we booked this hotel. We love to play at the pool! 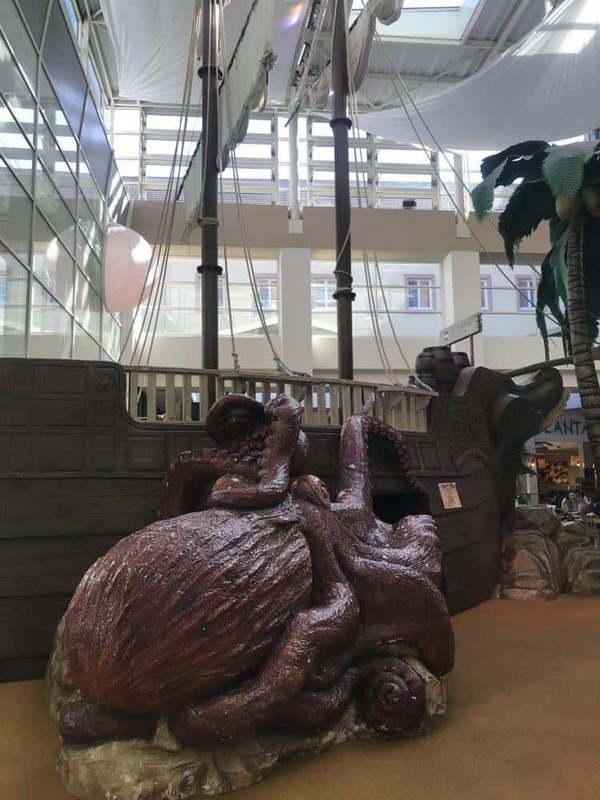 Entrance: You’ll enter to the left of the indoor pirate ship on the bottom floor of the hotel. You’ll see an attendant and you’ll sign in with your room number (but no need to show a key card). The attendant will inform you that all men need to wear speedo style swimsuits. Yes, you read that correctly, they do not allow board shorts and they are strict about the rules. We pre-purchased this style for my husband (a longer jammers style suit) and also a pair for my son. If you live in Europe, head to your closest Decathalon. They had some nicely priced suits. If you forget the rule or you didn’t read this blog, there is a vending machine with suits just inside the changing room. So you won’t be left high and dry. There are a few pool loungers, but not many and everyone has to remove their shoes in order to enter the pool area. The Indoor Waterpark features multiple slides and a pirate ship with shooters and bucket dumpers. Note: during weekday afternoons, the pirate ship is not operating and is roped off. This was a disappointment because chose to return to the hotel and visit before we headed home. So instead we played on the waterslides and in the pool. I would suggest bringing a life jacket or arm floats for the little ones because the pool is deep and the fun waterslides drop into at least 3-4 feet of water. There is a smaller slide off the backside of the pirate ship in only a couple inches of water, but you’d need two adults to make sure little ones didn’t venture around the stairs back to the deeper water. We are a fan of warm water pools and we thought that the pool was nicely heated. Also, note that towels are only provided with a 2 euro deposit. Make sure you bring money because for some reason they couldn’t charge it to the room. We found this out the hard way when we were done with the pool and forgot to check on the towel situation ahead of time, ops! To the right of the indoor pirate ship (bottom floor of the hotel), you’ll see an entrance into the indoor climbing zone. Tuck the children’s shoes into the cubbies and enjoy running around the indoor play area. We thought it was clean, but not attended by the hotel staff. 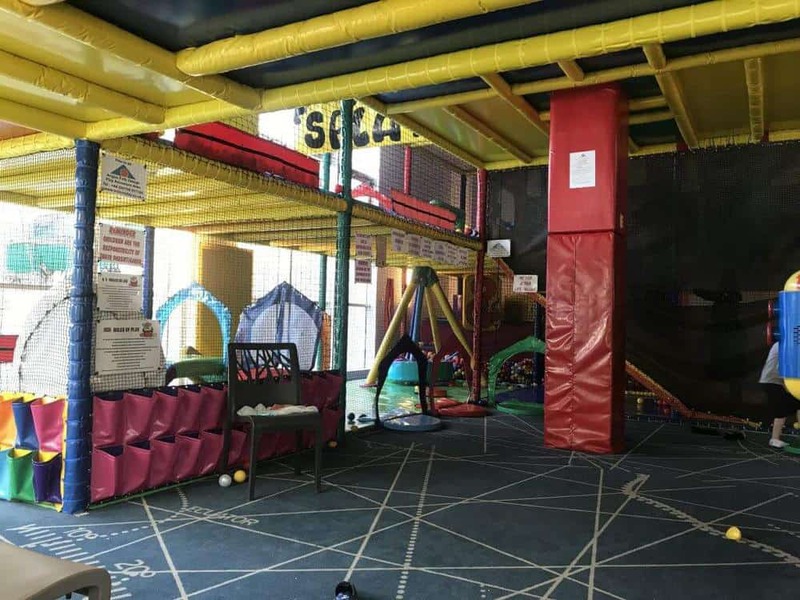 It is also close to the restaurant and cafe dining area, so older children could play safely while you finish your meal. On a nice day, head outside to explore the outdoor playground. So many fun features to climb. Since our visit, they’ve added new climbing structures outside with net climbing, slides, and lookouts. They look massive and great for older kids! There is also a huge green space with a lake and benches to enjoy a break. A small pirate ship adds to the fun inside the bottom level of the hotel. Climb aboard, steer the boat or hide in the belly of the boat. You’ll pay extra to play the games and quite a few were out of order when we peeked inside. 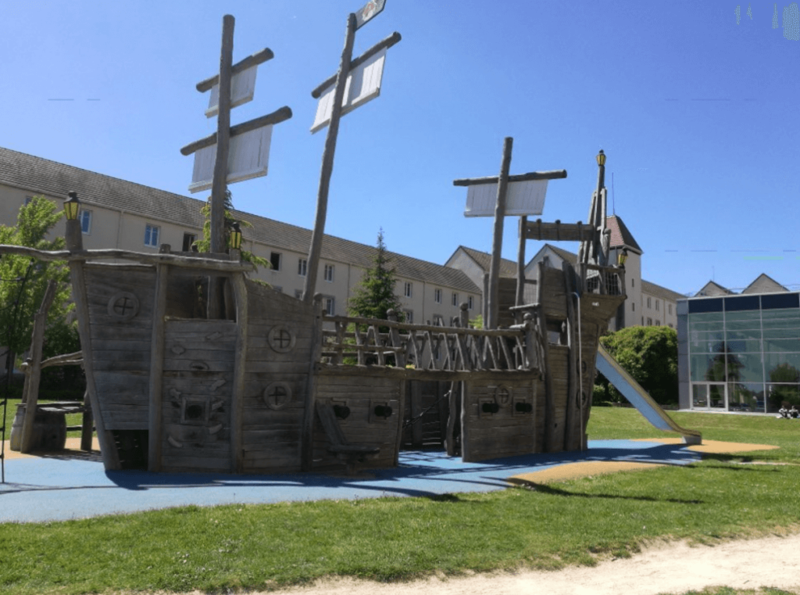 It is located to the left of the indoor pirate ship before you’d exit out to the playground. You’ll also pay extra to check out the Cinema. It looked like they had a fun list of shows offered. 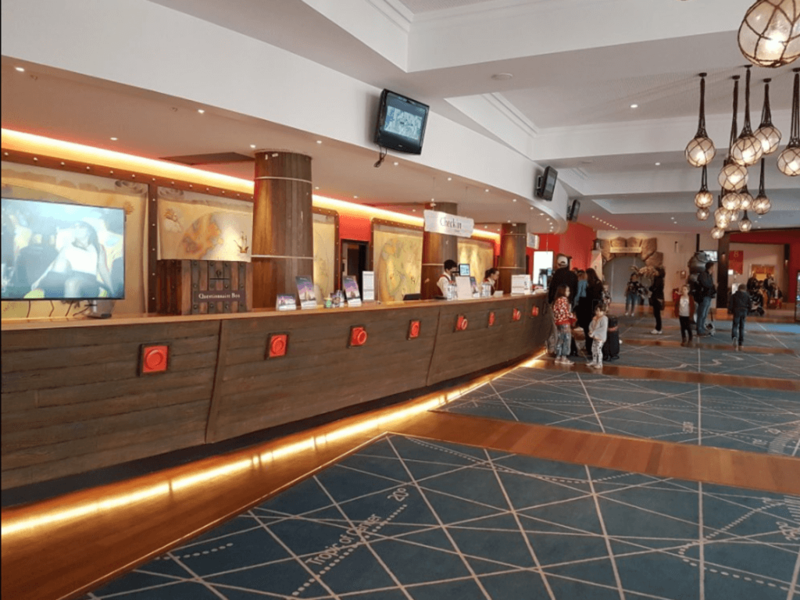 The Cinema and the bathrooms are located behind the main staircase on the bottom level of the hotel. Take a look at the showtimes if you want to fit in this adventure. Breakfast: it is a mix of cold cuts, yogurts, some fruits (mostly canned) and bread. There is also cold cereal and a selection of juices. It’s simple but felt more like sandwich supplies instead of breakfast. 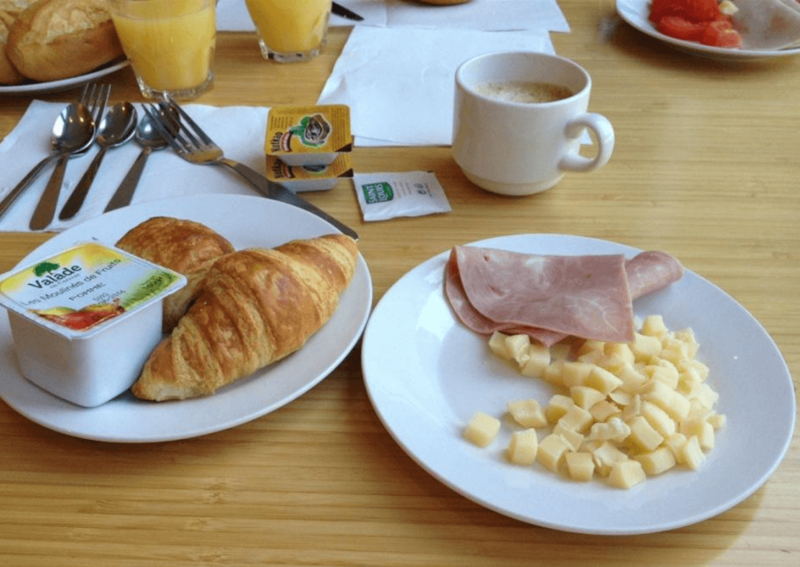 However, Europeans like a simple breakfast and if the majority of their visitors are European. If you do want warm eggs, you can pay extra and they will cook them just how you like off to the left-hand side when facing the buffet. There are also multiple signs telling you not to take away food. I won’t lie and say that we didn’t prepare a few sandwiches for snacks later in the day, especially since we didn’t eat very much for our actual breakfast. Dinner: You can pay for a buffet dinner, 24.50€ for adults, 12€ for children. The selection was just ok. They offered cold appetizers, a couple main meal choices (lacking in flavor) and cheese or deserts. For the kids, they offer the typical fare from chicken nuggets to pizza and french fries. It was doable since we didn’t want to pay to leave the hotel but a better option might be to order a pizza from the bar just outside the restaurant. We saw plenty of families enjoying this cheaper option. Or you can dine at the Captain’s Restaurant, which is a sit-down table service restaurant. The menu did look pretty good, but we didn’t get a chance to sample it with only two nights at the hotel (and one night we stayed in Disneyland past dinner). We did like the ice cream bar and the ability to order snacks between meals. 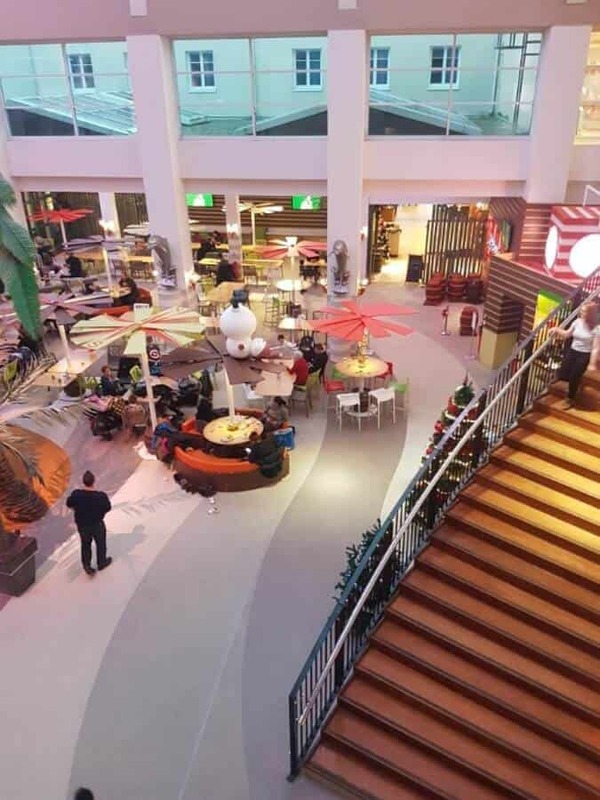 View down to the restaurant, cafe area, kids play zones and entrances to the pool/cinema/indoor climbing zone. Our room was comfortable for a two nights stay. It featured a double bed with a bunk bed off to the right. The bathroom consisted of two separate rooms, one with the toilet and another with the bathtub and sink. We didn’t have any complaints and we liked the small Disney store to browse without the crowds. I may or may not have a son that likes to climb. Kid Friendly? A huge YES! Would we stay again? Probably! 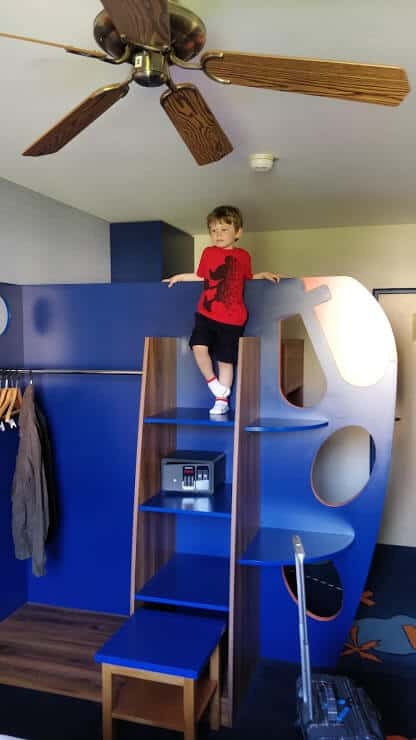 We are a huge fan of kid and family friendly hotels. It just seems to make our trips more enjoyable and our son always has a blast. Perhaps one day we will try a Disney Hotel, but honestly, Explorers was a blast and we would love to return. Head back to my Disneyland Paris Tips blog or maybe you want to see more of our travel destinations? Click on the link and explore our interactive map. Or head to our homepage to see what’s new on our blog.